For the endless years India has been the melting pot of different beliefs and doctrines. If we take into account its vast heritage and cultural diversity India itself a heritage site. Sprinkled with innumerable historical monuments, forts, palaces, churches, caves, tombs, mosques, temples, gurudwaras and associated structures, India allures its suitors from all over the world. This grand country has near about 27 world heritage sights. Of them 12 sites are located in North India. 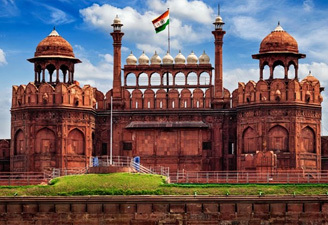 We have brought to you all these twelve wonders of the north India. Enrich your knowledge with us to choose your favorite destination. Agra houses one of the Seven Wonders of the World, built by Shah Johan in memory of his consort Mumtaz Mahal. 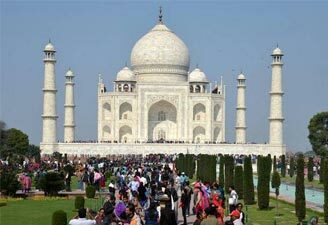 For the lovers through out the world Taj Mahal itself personifies Love. Constructed on a 313 square feet marble platform, it reflects the best examples of Indo-Islamic 'baroque' style. Sited on the right bank of the river Yamuna, Agra Fort is one of the most significant and vigorously built stronghold of the Mughal empires. Its richly decorated buildings reflect a distinct Mughal style of art and architecture. For around 10 years Fatehpur Sikri was the capital of the Mughal Empire. During the second half of the 16th century Fatehpur Sikri was built by the great emperor Akbar. This city of victory is lies 37 kms from Agra. 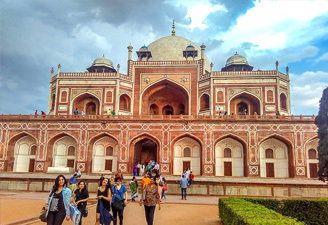 Indian subcontinent's first garden tomb, Humayun's Tomb was built in 1570 . The architectural structure is greatly influenced by various major architectural innovations, culminating in the structure of the Taj Mahal. 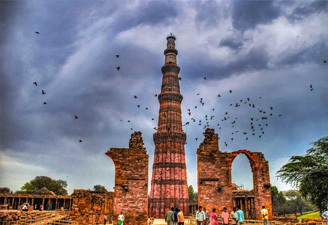 This 72.5 m high red sandstone tower, Qutb Minar was built in the 13th century. It placed few km away from the south of Delhi. 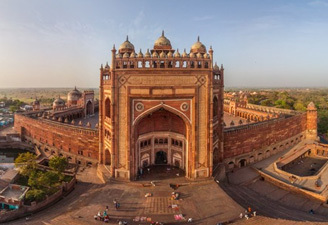 In its surrounding archeological area, Alai-Darwaza Gate, the masterpiece of Indo-Muslim art and two mosques, including the Quwwatu'l-Islam, the oldest in northern India, is placed. 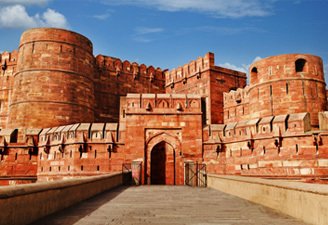 The Red Fort Complex was built by the 5th Mughal Emperor of India, Shahjahan as his new capital Shahjahanabad's palace fort. The palace was structured as a representation of paradise as described in the Koran. 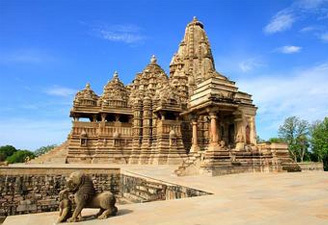 Khajuraho Temples were built during the Chandella Dynasty. These temples reflect two different religious beliefs i.e.Hinduism and Jainism and represent a striking balance between artistic ecstacy and religious harmony. You can see some of the finest example of indian architechtural genius here. 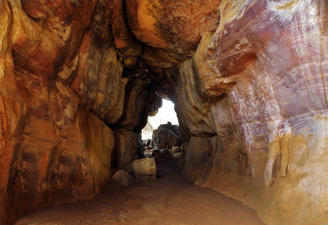 The Rock Shelters of Bhimbetka are sited in the foothills of the Vindhyan Mountains and about 45 km south east of Bhopal. Spreaded over 10 km this place has around 700 rock shelters which are displaying paintings that appear to date from the epipaleolithic period to the historical period. 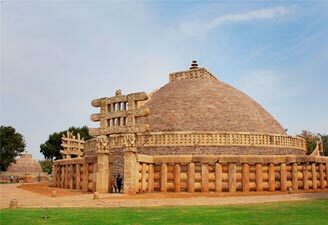 Kakanaya or Sanchi is world famous for stupas, monolithic Asokan pillar, temples, monasteries and sculptural wealth. This place is also known as the Kakanava, Kakanadabota and Bota-Sriparvata in ancient times. You can find here the architectural geniuses from the early Mauryan period. Maharaja of Bharatpur artificallly crafted this 28.73 sq kms wetland by building small dykes and damns. 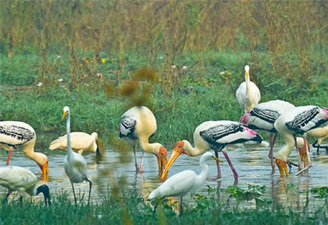 Just 176 Kms from Delhi, this pardaise for birding place should not be miss by an avid bird watcher. 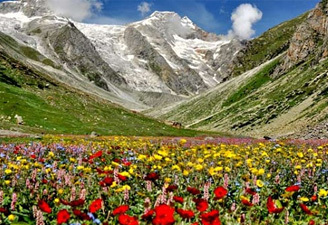 India's Valley of Flowers National Park, located high in West Himalaya, is home to many rare and endengered wildlife including black bear, snow leopard, brown bear and blue sheep. 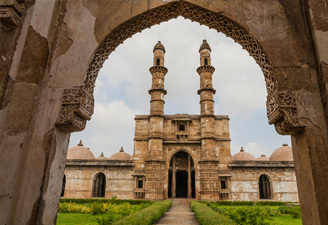 In Champaner you will find unexcavated archaeological, historic and living cultural heritage properties. This site includes vestiges, fortifications, palaces, religious buildings, residential precincts, agricultural structures and water installations. Visitig Time : Sunrise to Sunset.